Wrap the potato in foil, place on a baking tray and roast in the oven for 1 hour 15 mins. Wrap the fish in a piece of foil, put on the same tray and continue cooking for a further 10 mins or until the fish is opaque and cooked through. 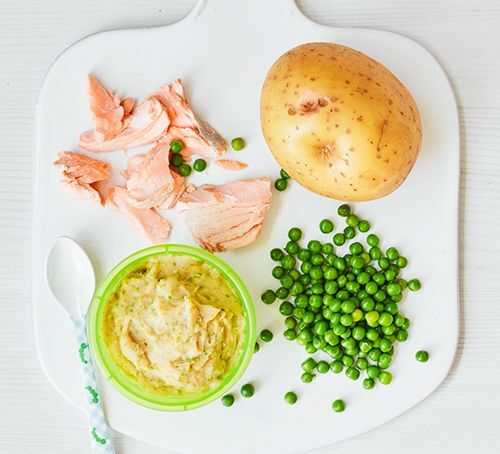 Blitz the peas, potato and salmon in a food processor, adding a splash of milk or knob of butter if you like, to loosen the purée. Serve one portion and divide the rest between small containers and freeze.